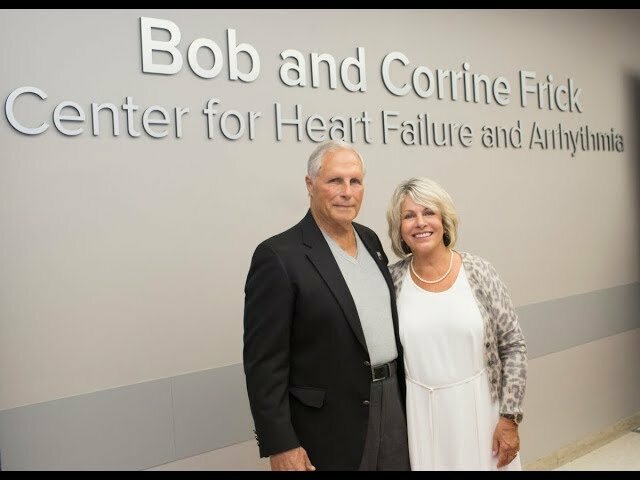 "It's so important that the community recognizes what they have here"
Bob and Corrine Frick have learned the value of world-class heart care through personal experience. Heart disease has afflicted many people in Bob’s family, and his own struggles with it led him to Ohio State. Bob and Corrine Frick of Westerville trace the origins of their relationship, Bob’s struggles with heart disease and how his treatment at Ohio State led to a transformational gift to help patients. “The thing I like about Ohio State: When you go see the doctor, he tells you why, how it’s going to affect you, everything about it"
The care Bob received here was central to the Fricks’ decision to become donors to the Ohio State Heart and Vascular Center. Their transformational gift made possible the Frick Electrophysiology Hybrid Suite, which allows clinicians to take on high-risk procedures in a safe environment and perform procedures that previously were not possible at Ohio State. Additionally, in 2018, it funded the Bob and Corrine Frick Center for Heart Failure and Arrhythmia, which was founded to study the intersection of the two diseases.